Last year, when I participated in a yarn crawl, I discovered Fabric Bliss, an adorable yarn and fabric store located in the Santa Fe Arts District in Denver. I was only interested in Fabric Bliss' yarn back then, but now that I have a budding interest in sewing I decided to pop in and check out their fabric and their sewing classes. I'm so glad that I did! 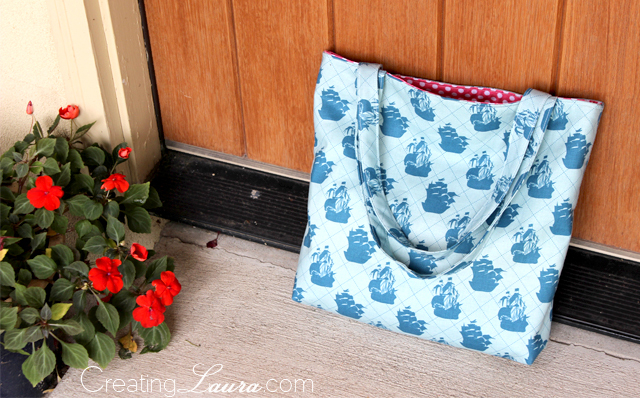 I ended up signing up for their Intro to Sewing class and making the reversible tote bag pictured above. Isn't it awesome? 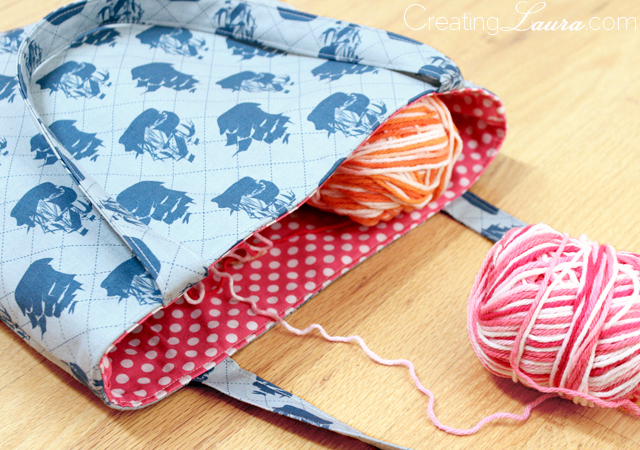 It's so perfect for toting around my knitting projects. I had such a great time at this class and I learned so much that I can't wait to sign up for another one. I'm thinking about doing the Hem your Pants class because pants never fit me or maybe the Zippers Made Easy class so that I can start sewing more serious things like dresses. 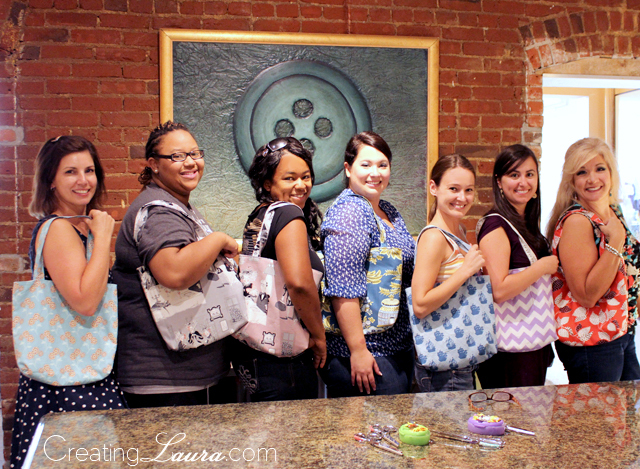 If you could take a sewing class, which one would it be? I still can't get over the fact that I made such a professional looking bag. It even has gussets! And I know what gussets are now! Nailing it. Your bag is gorgeous! And congrats on diving in with gusto into a new hobby. Wow, that is an impressive first sewing project! Love the fabrics you chose. Tote bags are my favorite bag silhouette... so roomy and comfy to carry. Have a wonderful day! Congratulations! It looks great! Gussets are great. Except for diamond gussets, those are the worst ever. I'm excited to hear about your upcoming classes! Fun; we can be tote-bag-twins! Wonderful, well done you. I think I would make a bag as well if I could, I do love a nice new bag. I'll be waiting to see what you make next! Looking forward to seeing your next sewing projects! Thanks! I love nautical themed everything. oh these are all so cute! It looks great! The whole gang picked such cute prints. I learned to sew after being an avid knitter too and it was a great feeling to be able to have a completed project so fast. Isn't fun? Yes, I love how quickly we made these bags. Instant gratification! Love your bag...well done. It is so nice to meet other friends through craft classes :) I think people that craft are some of the nicest people you will meet.